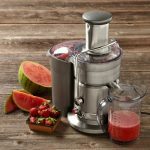 The Omega VRT330 Low-Speed Juicer is a masticating juicer, but way better than the other juicers available in its class. The VRT330 isn’t just easy to use but has built in features that ensure the juices are healthy, nutritious and delicious. In addition, there are also several accessories included that add even more value for your money. As far as features go, the VRT330 is packed to the brim. The VRT 330 has a dual stage juicing system so you can juice nonstop. Also, it gets more juice out of fruits and vegetables by crushing them first and then squeezing the pulp. The auger has a patented screw design so it can extract more juice. Many juicers process at speeds of 1,650 to 15,000 rpm but this actually destroys enzymes that your body needs. By contrast the VRT processes at 80 rpm, keeping the enzymes intact. Furthermore, the low speed stops oxidation and allows you to store the juice for up to three days in the fridge. Two juicing screens are built in, coarse and fine, so you can have your juices pulpy or smooth. The two spouts are for fresh juice and the 50 oz containers are for ejecting pulp. There are several accessories included in the package such as a cleaning brush, tamper and juicing cups. The included basket can be used to make soup. The VRT has an auto cleaning system that cleans the screen. In addition water can be poured into the chute to clean it. Because the VRT is vertically designed, it doesn’t occupy a lot of space on your kitchen countertop. There is a tray to catch any vegetables that might fall when using the juicer. There are only three settings (on, off and reverse) so you won’t have any problem learning how to use it. The reverse switch is particularly useful because you can use it to “unstuck” anything that gets stuck on the juicer. The Omega VRT runs quietly even when it is full of ingredients. The juicer is not just for oranges, but can also be used for apples, beets, and other fruits and vegetables. There is no frothing in the juice. The VRT has a 10 year full warranty. 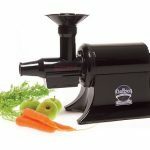 The juicer is not just powerful but also durable, more than capable of handling celery and other hard vegetables. It is very easy to assemble. While the VRT is a slow speed juicer, it doesn’t add air into the mixture. You need to scrub the basket well to remove the fiber that gets attached to it. The plastic container that holds the auger requires a bit of effort to remove, but constant use of the unit should take care of this problem. 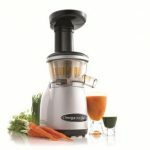 Let’s conclude this Omega VRT330 Low-Speed Juicer Review with what reviews this product is getting. The Omega VTR330 has been receiving rave reviews from many customers and reviewers because it is very easy to use, runs quietly and there’s very little pulp in the juice. A lot of customers are also pleased that the Omega VRT330 Low-Speed Juicer is heavy set and won’t fall down with a slight bump. The juicer has also been receiving praise from many first time users because it is easy to clean up unlike other products. Both first time and long term users agree that the juice simply tastes delicious. On the other hand, some people say that the unit is too heavy and that the VRT spins too slowly, but the slow speed is deliberate so the enzymes in the juice are preserved. 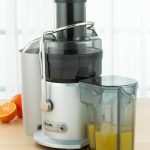 Should You Buy the Omega VRT330 Juicer? If you are looking for a solid dependable juicer, then the Omega VRT330 should be at the top of your list. 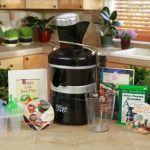 It is a powerful, easy to use and flexible juicer that can handle different kinds of fruits and veggies. If you’re health conscious (and you should be), the VRT330’s ability to keep nutrients and vitamins intact is reason alone to buy. Plus, the juices simply taste great. This is not the cheapest juicer out there, but it is worth every cent.